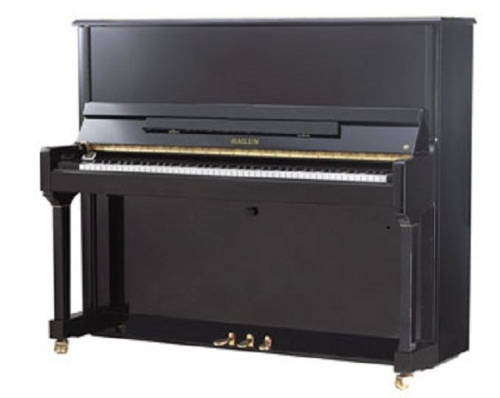 This 123cm piano is manufactured as a high performance Bernstein piano. This piano is popular among higher grade pianists. With a very responsive action and a strong rich tone, this piano gives it all, to any player. Higher Quality Pianos that will deliver Grand piano tone. Call 9477 5866 to find out more about the Bernstein H series pianos and what they have to offer in the various models made available through Piano Magic, 79 Belgravia St, Belmont. Speak wth any of our staff, who will be more than happy to assist you in whatever way you need. The H-3P has a beautiful Brass or Gold looking inlay running down the piano. It is stunning. Inside all the Bernstein piano is the Model No. This helps in identifying the piano if you ever want to sell or describe it. H-30P seen in this picture. Normally the section arrowed in the picture, is muted with felt as it has bad overtones. On the H series this section is allowed to sing and is designed to produce harmonic partials that enhance the tone of that note. This is normally called ‘Duplex Scaling’ and is often only seen in High quality grand pianos. Wurzen Hammer Felt been around since 1783 is renowned world wide as being the best felt for piano hammers. It is made in a town called Wurzen north of Leipzig, Germany. The H series Bernstein all have the Aluminium key bed. The benefit of the Aluminium key bed is in the stability of the regulation. For years pianos have had changes in the key touch due to humidity in the key bed. The Aluminium surround on the Set Off Rail has a similar affect as the metal key bed. In piano design we are looking for stability and reliability in all climates. The Aluminium surround on the Set Off Rail gives the piano that stability in allowing the hammer not to block against the string or not being able to play soft as the hammer is setting off too far from the string. In older pianos the key pin hole was just drilled into the Spruce of the key. This was fine until the piano was worked hard, then the hole would become oval allowing the key to stick. The Beach inlay helps with wear and tear. Mice can cause up to $2500 worth of damage to your piano in as little as 2 weeks. All upright Bernstein pianos are Mouse Proofed to assist in protecting your investment. Note: the tabs under the pedals. Also upright Bernstein pianos have a closed in bottom to stop vermin from entering via the underneath of the piano. Beach timber rails are the best to use for the key frame as they support the key pins during the regulating process. Many pianos are produced with pine Key frames and to regulate and level keys is a nightmare, as the pin moves in the wood instead of bending. Metal Pedal Rockers give a better feel on the pedal as the movement is more positive so a finer adjustment is possible. The Sustain pedal needs a bend at both ends so the rocker is balanced and dosent wear the rocker bushing. The H-3P has a good quality two wheel castors to help with moving the piano. At Piano Magic we always oil the castors to help them on their way. It is very important to have a mute rail with a good design. This rail needs to be removed each time the piano is tuned. On the H-30P the rail can slip out with a slight pull from the technician. It adjusts easily and has superb muting felt so when the piano is played with the mute on, and the sustain pedal down there is no Bleed off the neighbouring notes. This means that when a “C” is played the C# and B do not play.